We completed a major redesign and redevelopment for one of our oldest clients, Dan Renner of Los Angeles Computerhelp (formerly R&B Computerhelp), accomplishing what amounts to a completely new website. 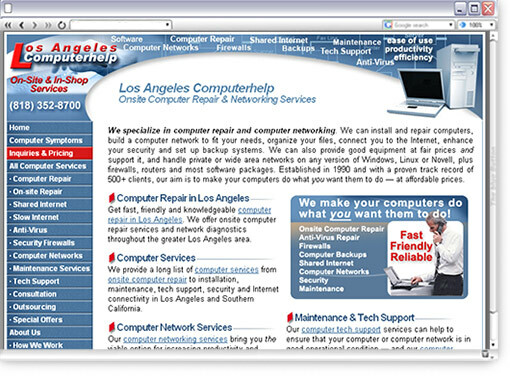 The new design conveys an instant impression of what Los Angeles Computerhelp offers. Retaining the logo, images and ad copy which we had designed and written for an earlier version of the website, we tightened up the text to make it "visitor friendly" and added features to attract more customers. We also added a new "signup" box for LACH's Computer Networking News, enabling them to provide tips and announcements to their client base via email. Subscription information is automatically sent both to the company and the individual subscribers — hereby ensuring the validity of subscriptions. Dan has since sold his company, and has moved on to new opportunities. 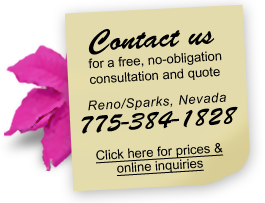 "We just got a major new client from the website. It must have been within moments of uploading the newly designed website."